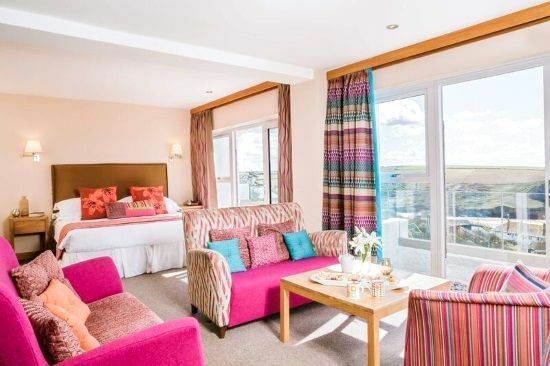 Bedruthan Hotel & Spa offers the perfect 'staycation' destination'with stunning views of the sea, contemporary interiors and family focused facilities and staff which sees guests return year after year. 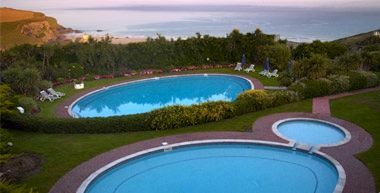 The hotel offers a fantastic choice of accommodation options including rooms, apartments and villas. 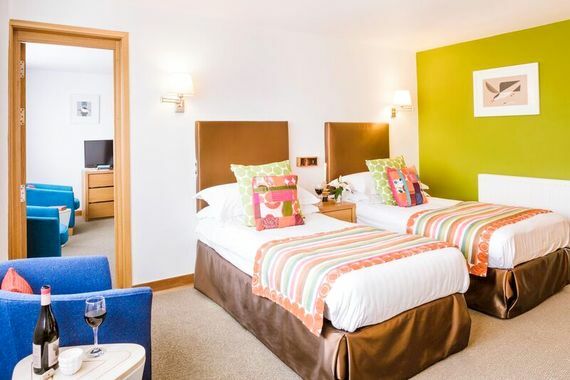 The hotel rooms are perfect for those who are happy to have little ones in with them, as there’s plenty of room for an extra bed or cot. Interconnecting twins and singles are available, as well as apartments that are great for larger or extended families. For those with energetic offspring with lots of energy to burn the villa accommodation is ideal with french doors leading to a private patio. Parents can recline on a sun lounger while watching the little ones enjoy excavating with miniature JCB's and climbing the pirate ship. Bedruthan really knows how to show kids a good time with outdoor play areas, indoor and outdoor swimming pools and the Jungle Tumble room with ball pools, slides and jumps, as well as the highly recommended Kids’ Club. Activities are well planned and tailored for different age groups. 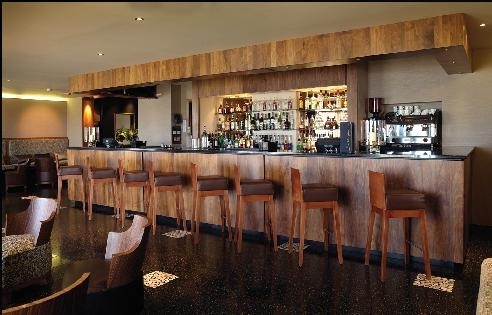 There are also plenty of adult only areas within the hotel. 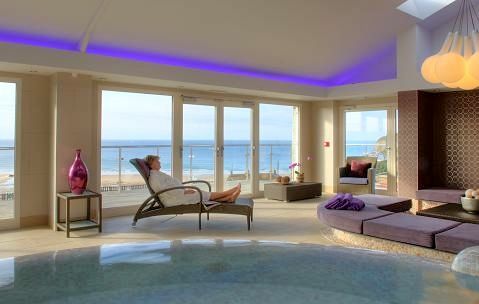 Top choices include a pampering session in the spa areas, a game of tennis, a stroll along the cliffs or relaxing with a coffee and good book in the Tranquility Room. Breakfast and lunch are family affairs and there are a variety of dinning experiences to choose from including the Wild Café and the Herring. An early kids’ tea with attractive and nutritious options is available with bibs, cutlery and cups all provided. For those parents that want a grown up dining experience, you can dine later while taking advantage of baby listening/babysitting services. Children over eight may dine in the Herring for a supplement. Tantrum Alert! The biggest complaint we’ve heard about Bedruthan Hotel is the challenge of trying to get the kids into the car at the end of the holiday. Be warned! 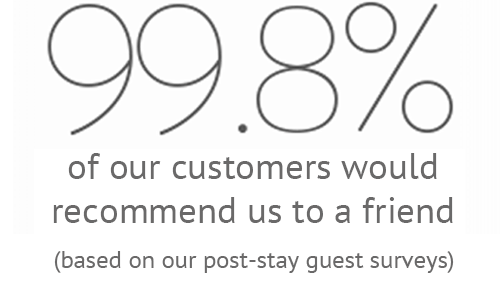 Prices are from £199 based on one night's stay in a family room (sleeps 2-4) with breakfast. With the endless choice of activities at the hotel and nearby there’s a risk of returning more exhausted than when you left! 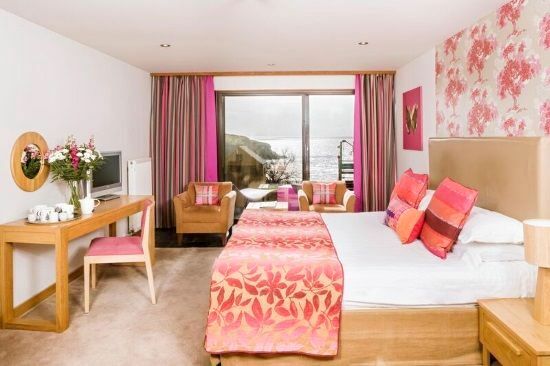 Just in front of the hotel is the award-winning Mawgan Porth beach, great for little explorers with its sandy coves and rock pools to fish and splash in. The hotel is a great place to start many of the Cornish coastal path walks (ask staff for advice on the best ones for children and buggies) and the eleven golden beaches of Newquay are all a short drive away. Golf is available at coastal golf courses St. Enodoc and Bude and there’s an 18-hole championship course at Trevose. If you fancy learning to surf Bedruthen’s resident instructor will be happy to oblige and for those who need a bigger adrenalin hit the Adventure Centre at Lusty Glaze offers abseiling, rock climbing, a zip wire and coasteering. The Lappa Valley Steam Railway is a 25-minute drive from the hotel and a fantastic day out with activities for all ages including train rides, a boating lake, a maze and crazy golf. Breakfast and dinner are included at Bedruthen and there’s a great kids’ menu at lunchtime but for those who fancy venturing out for a meal there are plenty of options. Mawgan Porth beach houses a pub, fish and chip shop, café and bistro. Celebrity chefs are not in short supply, Rick Stein has four restaurants in nearby Padstow alone and Jamie Oliver’s Fifteen is practically next door at Watergate Bay. Watergate Bay is also home to The Beach Hut serving café food and delicious hot chocolates in an incredible location. Other must see Cornwall sights are the Bedruthen Steps National Trust site, St. Ives, The Eden Project, The Lost Gardens of Heligan and St. Michael’s Mount. The nearest medical centre: a doctors surgery can be found in St Columb Major, minor injuries hospital in Newquay and main hospital in Treliske. Mawgan Porth beach is in front of the hotel. Walking distance to shops etc. There are several pools at the hotel both indoors and outdoors. The hotel has an extensive spa. Children 8 years and over can join the older children's club offering which children can pop in and out of all day from 9:30 - 3:30 (school holidays only). Evening sessions are available for children 5 and over from 7:15 - 1opm at a cost of £13 and subject to availability. 7 days a week during school holidays and weekends in term time. Babysitting and baby listening services are available. There is a selection of baby gear available including wooden cots, highchairs, baby bouncers, sterilisers, pottys, stairgates, bed guards, socket covers, plastic crockery, cutlery and sippy cups etc. There are also several all-terrain children's buggies and toddler back packs available. There is a range of toys and books available. Buckets, spades, ride ons, a play house, mini JCBS, a pirate ship and trampoline are available for outdoor play. 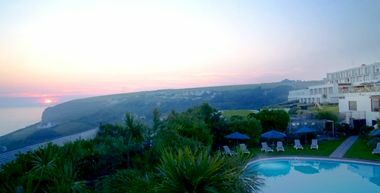 The Bedruthan Spa offers a full menu of treatments. The creche at Bedrtuhan hotel & spa now offers 2 hours free childcare a day for children aged 0-8 between these times: 9:30 - 11:30, 11:30 - 1:30, 1:30 - 3:30. Breakfast and dinner are included. Children's tea is provided or children can have an evening meal with parents in the family dining room. A full range of lunch options is also available for adults and children. The hotel has a small gym.